Often times gardeners will mix up an insecticide spray and store any leftovers for the next application. But is it still good? Maybe. Mixed pesticides lose effectiveness depending on their type and the time stored. When powdered pesticides are kept dry and sealed, they can last for quite some time; the same is true for liquid formulations. But once they are mixed with water the solution may quickly lose it's potency. It is the pH level of the water used in the spray mix that influences the chemical breakdown of many pesticides. The pH of a liquid is the measurement (ranging from 0 – 14) of its acidity or alkalinity. Seven is neutral, above 7 is alkaline and below 7 is acidic. Some insecticides, particularly the groups known as carbamates and organophosphates, undergo a chemical reaction in the presence of alkaline water. The reaction is known as alkaline hydrolysis, and reduces the effectiveness of the pesticide’s active ingredient. The chemical breakdown of a pesticide is commonly referred to in terms of its half-life. A half-life is the period of time it takes for one-half of the amount of pesticide in the water to degrade. A common insecticide, sevin, has a half life of 100-150 day in solutions whose pH is at 6. That number rapidly decreases to 24-30 days at a pH of 7. At a highly alkaline solution of 9, its half life is only 1-3 days. Malathion’s half life goes from 8 days to 19 hours as the pH shifts from 6 to 8. One of our old fungicides, captan, last about 8 hours at neutral (7), and only 2 minutes when the spray solution is at a pH of 9. When mixed pesticide solutions are stored for days, weeks or months, their effectiveness can greatly diminish. Planting carrot seed over and over again? ... only a few grow? Carrot seeds are small and slow to germinate; the seedlings are fragile, consequently problems can arise. First, check the package to see if the seeds are outdated. When heavy rains occur, the seeds can easily wash away. Placing some type of cover over the seed bed, at least until the seeds have emerged, will help. Soil preparation is important; few seedlings will be able to emerge through a crusty soil. Here are some simple directions for planting: 1) plant carrot seeds 1/4 inch deep in heavy soils and 1/2 inch deep in light soils. 2) Thin out dense seedlings carefully in order to give roots enough room to expand normally. 3) Space plants 2 to 4 inches apart. Carrots are considered a cool season vegetable crop. Consequently, the best production will be during the cooler months of the year. Seeds should be planted from September to April if in the tropics. Ideal temperatures for growing carrots are between 60 and 70 degrees Fahrenheit. Temperatures above 75 are more likely to produce poor quality carrots. In Hawaii, the following varieties do well: Nantes, Chantenay, and Denvers Half-Long. What causes the scabby bumps on citrus fruit? 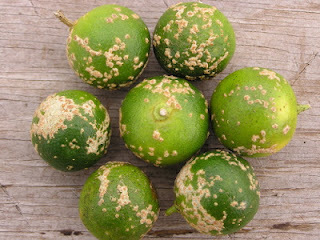 This disorder, common in high rainfall areas, is called citrus scab. The disease occurs in Hawaii, as well as in Florida, but not in California due to the dry climate. It is caused by a fungus, Elsinoe fawcetti, and affects a wide range of citrus. The light brown, raised, warty scabs appear on young stems, leaves and fruit. Leaves develop some resistance to citrus scab with age. The scabs consist of the body of the fungus plus the swollen tissue of the host plant. Spores are produced within these scabs and will spread to other tissues by the splashing rain or irrigation water. Infection occurs when the spores germinate on a susceptible plant surface that remains wet for approximately 3 to 4 hours. · Select a resistant species or variety. · Plant in a sunny and dry location as is available. · Intercrop citrus with non-citrus plants or resistant citrus trees. Citrus scab can reduce yield and will certainly reduce the quality of the fruit. For home production, as bad as it looks, the fruit can still be sweet and juicy. For those caring about the external appearance of the fruit, trees can be sprayed with a copper fungicide. Yet even numerous applications may not be effective in high rainfall areas. Highly susceptible citrus types: Fremont, Clementine, Murcott and Frost Satsuma mandarins; Orland Tangelo; Tahitian lime and Rangpur lime, often referred to as the common lemon in Hawaii. Not susceptible or immune citrus types: Sweet orange, navel orange, pummelo and grapefruit.